UK: Sensors have been added to two of the gravity-base foundations being installed at the Blyth demonstration project off the north-east UK. The sensors are part of the FS Found programme, backed by the ORE Catapult with BAM Wind Energy. According to the ORE Catapult, it is the first time sensors have been installed to a concrete gravity-base foundation. The sensors will be compared to the data from the nearby met masts to show how the foundations are performing in the real-world environment. "Incorporating a condition monitoring system into this first demonstration of this new technology will help the industry to improve design optimisation and reduce costs, helping to make gravity-base foundations commercially viable as a foundation solution," said ORE Catapult's technical lead of FS Found, Jonathan Hughes. 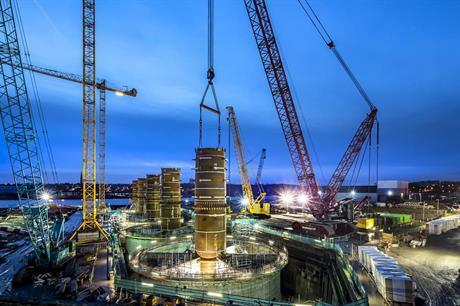 Installation of the five turbine foundations commenced last month. The 41.5MW project will feature MHI Vestas V164 8.3MW turbines.